YOLO Run – The Redemption Run (by KenJoe) | JustRunLah! 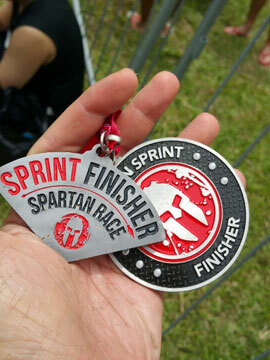 And so after a break, I went back to 10 km races with the Straits Times Run. Didn’t have enough time and there wasn’t any ‘interesting’ topics so I will skip the account for that. Suffice to say it was a reasonably satisfactory race in most aspects. 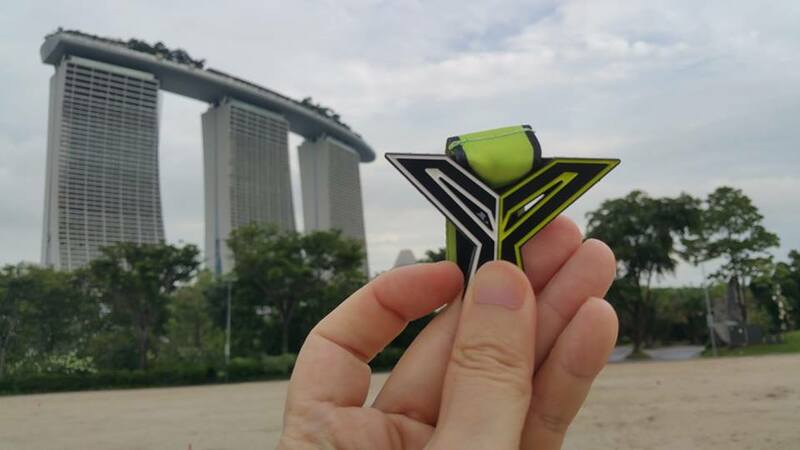 YOLO Run 2017 was deemed a ‘fiasco’ by many (or at least the vocal ones) for many reasons from logistics to the actual race distance itself coming in around 7 km instead of the expected 10 km for example. Still, the organizers spent 11 months to redeem itself, braving the criticisms throughout this year. There were folks who didn’t plan to run but were commenting on the facebook page and adding along the line of ‘I’ve told you so’ whenever things go wrong this year. As I was a past participant I took up the complimentary slot that was offered, registering quite early. My expectations were rather low. When the time came for race pack collection, I went there without expecting too much. I was surprised to notice there was no queue and I got my race pack in less than 5 minutes. However I wasn’t expecting to be collecting a bib, a Tee and a can of Nuhoney with no carrier. I guessed this was probably due to cost cutting measures. On the other hand, it could be a good move to align with the Green Movement except it was not communicated thus. A lost opportunity perhaps. At the same time I was told that we would collect the finisher medal and drawstring bag on race day – of course the medal makes sense. Anyway, my expectations were low as I said. And also having left the corporate world, one rule I learnt is that there aren’t any free lunches in life (usually). So it was ok too to not have the foam roller or the singlet (sports bra for female runners). When I went back, I noticed the online grumbling started to grow louder. I even noticed one post that said he/she didn’t get the yoga mat too – that was last year’s package so was it a typo error or? But you get the sense – a lot of noise amidst the more valid complaints. One major complaint I read was runners wondering when the delivery of the race pack by Honestbee would reach them. The organizer had partnered with Honestbee to deliver the race pack for $5 a piece. As the timeline for the race drew closer, the anxiety of the runners affected grew. Apparently in the end, some packages would be sent by the night before the race. It seemed like there was no visible tracking of the delivery status and the folks directed questions on the facebook page. Of course not all the questions were answered individually. That led to more frustration. It appeared too that some genuine runners decided not to participate at this point. It is understandable too as runners would like to prepare the bib and tees before the race whenever possible. Many queries appeared online and if one were patient enough to browse through, a large number of them was repeated queries and some were answered but most were frustrated because the organizer didn’t answer their queries individually – ‘why I got no answer; at least you got your answer…’. I believe if more open and effective, timely communication were given, much frustration would have been avoided. And race day coincided with the wet season. The rain worked through the night till the following morning. I remembered that 2 out of 3 times I attended YOLO race so far, it had rained briefly too, either at the beginning or near the end. I was early by an hour at the Gardens By the Bay venue and ended up walking around with an umbrella initially. It was announced early too that the race would be postponed by half an hour due to the weather. For that, the organizer was prompt enough and the race did start punctually at the rescheduled time. I avoided depositing bags for most races since I want to avoid queues. I deposited my umbrella at the workmen site nearby. If I returned and it was there, I would just take it. The workmen were welcome to take it if they needed it more than me. 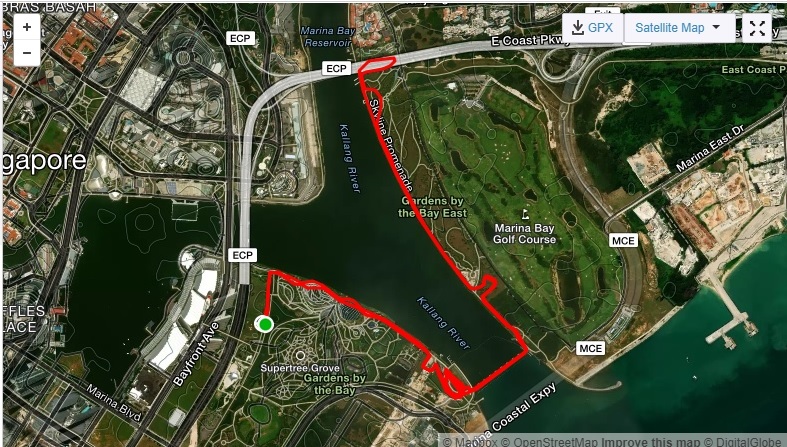 I ran the 10 km but realized at the 1.3 km mark according to my Garmin, that perhaps the distance was again out. The big sign said 2 km. And then we went up the ramp. I thought perhaps the 2 km sign was placed there because the folks didn’t want to carry the sign up to the ramp. However that was the last thing on my mind. I was enjoying the run and the moment. It was rare to be running after 7.30 am and not having to face the sun. It was cooling and pleasant run throughout probably due to the downpour earlier on. The ramp didn’t feel as bad as in previous other races. In fact coming back on the loop, the second round seemed as good. By then, I got a sense that it would probably be less than 10 km. Checking my Garmin at the finishing point, it was only 8.86 km. Some got it closer to 9 km. An improvement over previous year’s 7 km but still it fell short by at least one km. As I had only stopped once at one of the hydration points, I didn’t notice specifically how each hydration point was staffed. Based on some accounts, one such point was staffed only by two volunteers who were trying their best to serve the runners. I have to give kudos to the volunteers who had braved the weather and spent their precious time for this event. Still, due to the rain, the event ground was all muddy. Most pairs of shoes were caked with mud, including mine at the finishing line as we queued for the finisher medal and the other stuff. The good thing was there was positive energy and folks were just chatting around with their friends or patiently waiting their turns to collect the items. I was standing behind Spiderman (the runner) in the queue when a middle-aged man in front fell backwards as he suddenly lost consciousness. I felt we kind of froze briefly as we tried to make sense of what was happening. Then I tried to position myself near his head and was prepared to keep folks from crowding around him, to give him the space to breathe. Most of us were a bit stunned but almost immediately, folks started shouting ‘medic’. Very soon, two men could be seen making their way quickly forward through the crowd. The fallen man’s eyes and mouth were open but he was very still. Then I saw him blinked and I knew he was going to be alright. He lifted his neck as he tried to sit up. By then, the medic had squatted near him and helped him up. Someone picked up his handphone and gave it to one of the two men. They steered him towards the first aid tent in the end. I heard the man asking about his phone and the man behind him reassuring him and showing it to him. He seemed cognizant of his environment by then but I hope he would just go and visit a doctor just to make sure everything was alright. We were a few feet away from the booth when I saw two young volunteers handing out medals from a box. They were trying to expedite the process by giving the medals out first – basically they had to also mark the medal taken off your bib as they handed them to you. That might explain why they didn’t put the medals in the bag in the first place – some were questioning the process after the event. But kudos again to the volunteers for doing a great job and the two men who were at the scene almost instantaneously I collected the drawstring bag and can of drink without any additional issues. 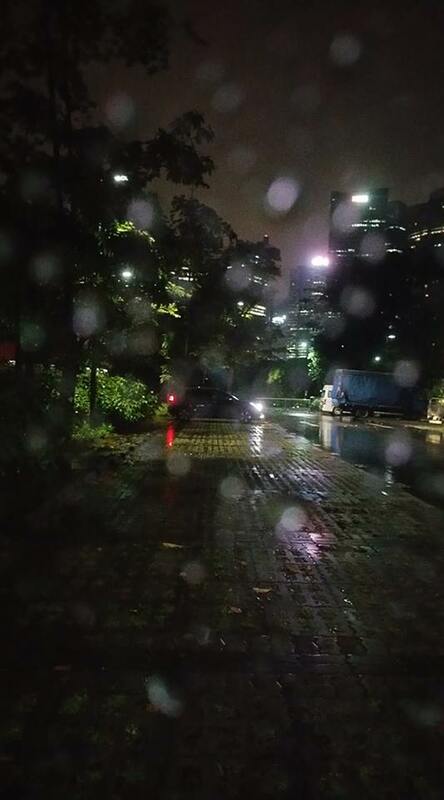 After that, I walked back to retrieve my umbrella and got my handphone out as well. I had entered one of the contests and was lucky enough to win a carton of 24 cans of Nuhoney. There were 3 winners and we were told to collect personally from the booth on race day. As it was, the booth was located in a deeper spot where the ground was all filled with water and mud. As the person-in-charge was not around, and after waiting for some time, we took a photo of ourselves with the volunteer and the cartons. It was just as well too. By the time I reached the road junction, it started to rain again. 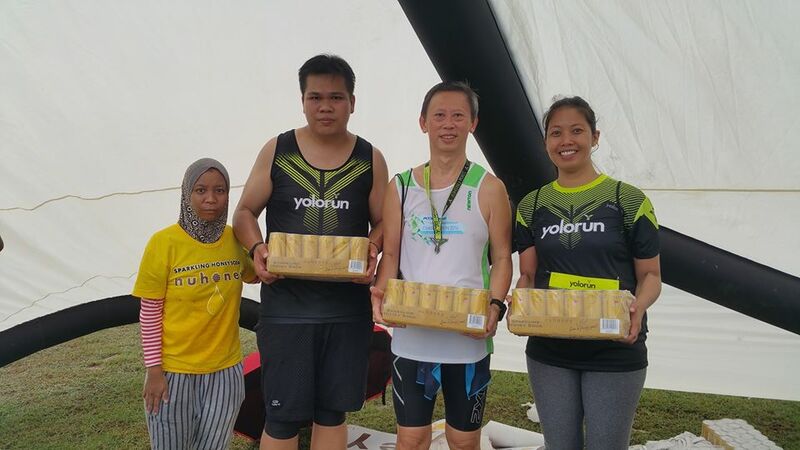 But I was glad and happy that runners exhibited a very positive spirit at the scene despite the weather conditions, the muddy terrain and perhaps even the unpleasant logistics some might have gone through the past few days. Runners are generally a forgiving and positive lot. In my opinion, the organizing team had redeemed itself somewhat but there was still a lot of room for improvement and they must realize that runners would also be more selective over time. So kudos for all the good work and more reflection on the feedback and better communication for future events. You Only Live Once – either take it and enjoy it or just leave it and not dwell on the unhappy stuff over and over again. My next race was the Performance Series finale race the following day, also a 10 km race. 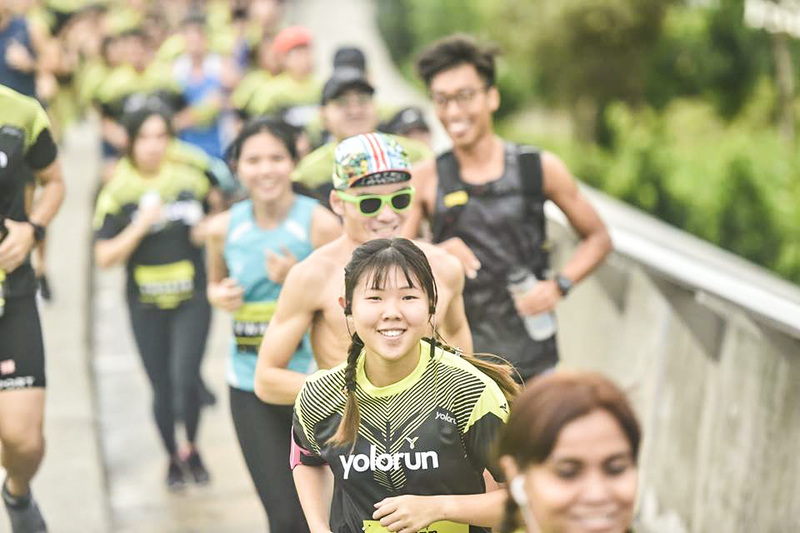 (Featured Photo Credit and Thanks goes to Tan Kim Lai who braved the rain and spent time capturing many photos of the runners – FaceBook: U-Run I Shoot Gallery). Welcome back. Always a pleasure to read your reviews. Information on race entitlements owed for paying customers still not provided. Nothing self entitled here. I paid and did not receive all the entitlements. Oh dear, you may want to feedback to YOLO organizer instead – checkout their facebook. I’m a runner too and can understand the frustration. Hope you get it resolved soon !